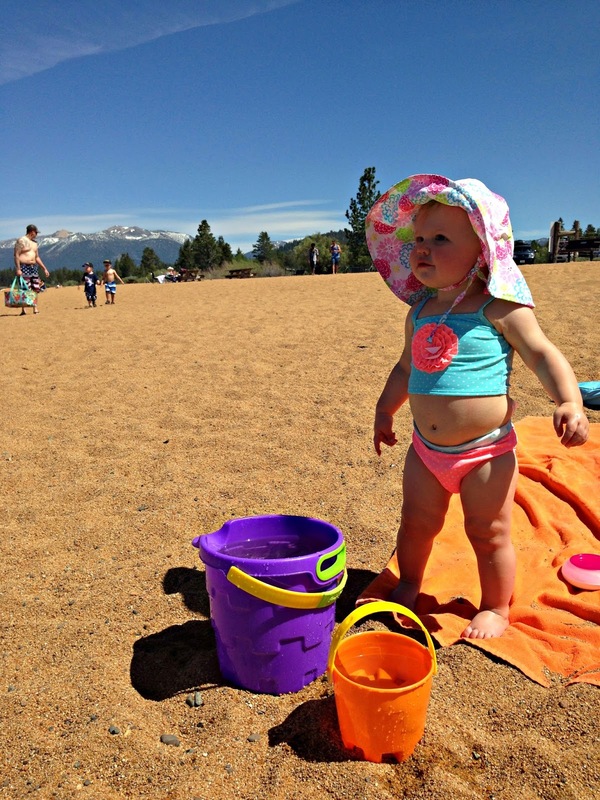 Going to the beach with a toddler is slightly different than hitting the sand with your girlfriends. Yup, long gone are the days of lounging on the beach with a good book, playing volleyball or swimming. I'm not saying beach days are over, they've just changed. But when you have the cutest little girl in the world [IMO] it makes it all worth it. With the warm weather upon us we've been spending a few days a week at the beach. I think it's safe to say I have packing the essentials down. Oh, I'm a less is more kind of gal. SUNSCREEN | This is a no brainer! 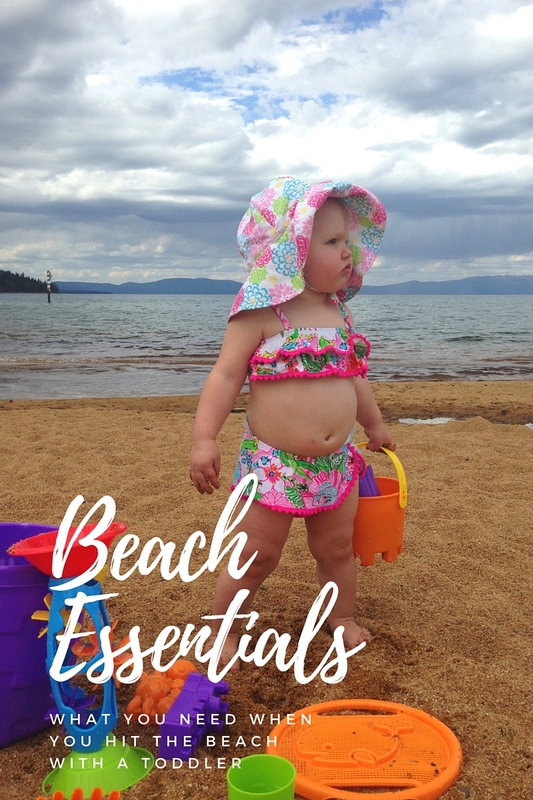 I personally like Hawaiian Tropic for myself and Babyganics for Emerson. SNACKS | My child is ALWAYS eating. She has no shame in her game. I typically pack a few pouches. 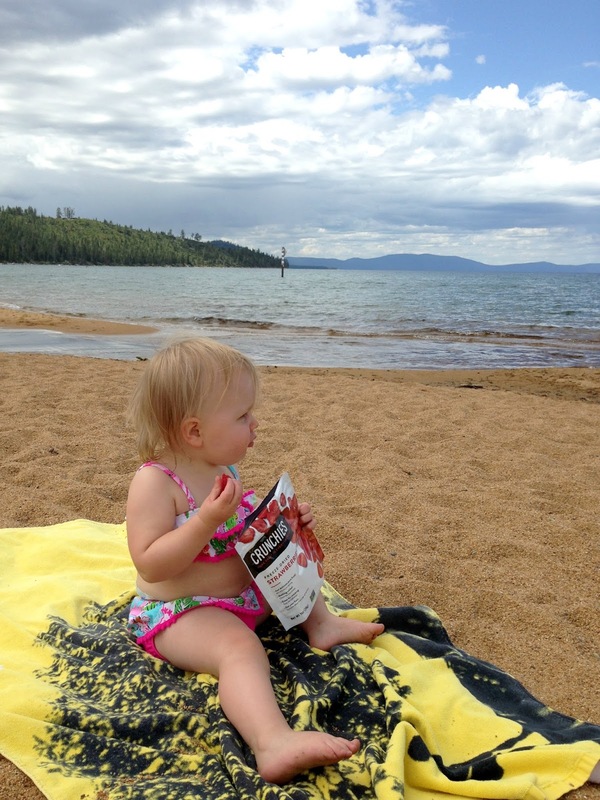 Recently I discovered Crunchies [c/o] freeze-dried fruit snacks and well we LOVE them! Yesterday at the beach Emerson was munching on their freeze dried strawberries. Crunchies are available in flavors like strawberry banana, blueberry, cinnamon apple and mango! With just one simple, authentic ingredient - fresh fruit - Crunchies has developed a snack food that's not just addictive and delicious but packed impressive nutrition to boot. WATER | Like sunscreen it's a no brainer. I pack a water bottle for me and one for Emerson. We use this and this. TOWEL/Blanket | I suggest an oversized beach towel. The towel is usually for sitting. Trust me, ditch the beach chair and embrace the towel. Unless you have a wheel barrel to shlep everything it just makes life harder. COVERUP | For Emerson we personally use a terry cloth coverup. This way it doubles as a towel! UMBRELLA | When the sun is beating down it's nice to have a little shade. Plus, it makes for a perfect little area if your toddler feels like napping. However, that never happens for us. TOYS | You can't go to the beach without toys! Emerson's beach toys are from Costco [similar]. DIAPER ESSTENTIALS | You never know when the next diaper change will be. I have a 'grab-and-go' clutch with the essentials -- a few diapers, wipes, little bags and hand sanitizer. Whew, are you still with me? If you are I pack everything in a backpack [minus toys and umbrella]. Thanks for this great list and your little one if adorbs! I always forget the diapers for some reason!